Recently, I read an article from Mckinsey Quarterly March issue on "Making a market in talent" by Lowell Bryan, Claudia Joyce, and Leigh Weiss. It is especially relevant to the EO grade which is suffering from the symptom identified in the paper. The solution offered, which could be a suitable model for an improved posting policy, is helpful to improving the career development of EO as well as professionalizing them as experts in resource and system management. But I think its implementation requires great courage, a quality wanting of civil servants. A common phenomenon mentioned by the author is that many organizations spend a lot of effort selecting and recruiting high-caliber individuals wherever they are found, but pay too little attention to allocating their internal talent resources effectively. Many frustrated managers search in vain for the right person for a particular job, knowing that one is somewhere in the organization. And many talented people get stuck in a corner, never finding the right experiences and challenges to grow. They may finally leave the organization for greener pasture. Organizations typically allocate people through personal connections and transactions between individual bosses and individual employees or within small groups. Managers find it difficult to know who among the ranks is the best person for an available position; ditto for talented people who want to know what opportunities exist around and whom they may like to work with. This predicament is a common one because most organizations focus their efforts on helping managers move up the line-management hierarchy and become better general managers. They usually spend less time developing the people who have the talent required for specific expertise in professional areas. The rewards of line management motivate talented people to seek line opportunities over professional ones. This approach is built from a paternalistic, hierarchical mind-set. Senior managers or human resources departments are expected to create opportunities for the most talented people through formal job rotations. The fact is that such traditional hierarchical models, which "push" resources to where organizations deem them to be needed most, are proving much less efficient in deploying and developing talent. 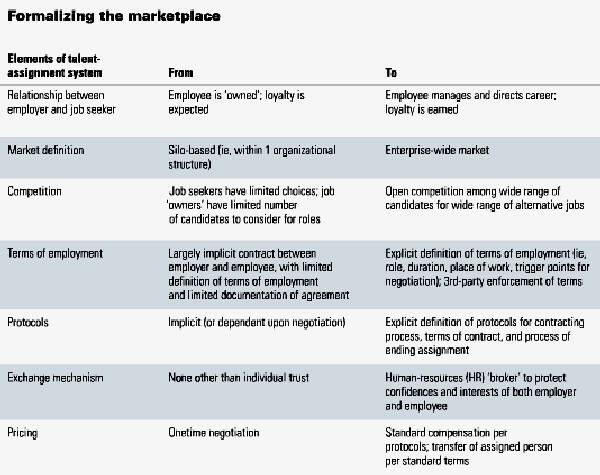 Taking the approach used in law firms, many professional-services groups and academia, where there are informal talent marketplaces for senior people to find the best junior employees and the best junior employees to choose the most attractive assignments, the authors propose that formal talent market should be established in large organizations. To facilitate exchanges, a formal talent marketplace needs "market makers": usually central human resources staff in the case of managers, or staff assigned to help a formal network executive in the case of specialized professional talent. The process begins when all open opportunities are posted on an internal website for a minimum of one or two weeks, with description summarizing the job requirements. It should also specifies its location, job band, title, important characteristics of the person who will fill the role, its educational and experience requirements; and other factors. The manager of the new position screens applications and chooses a subset of the group to interview. An HR professional helps with the screening and ensures that the manager has a balanced group of candidates. In the end, the manager informs all of them of the decision. The method, if adopted for EO, represents a significant change from the traditional, top-down, non-transparent process to one that is interactive, transparent, effective placement of matched person to the right job, and one that will earn employee loyalty. The authors draw up a table demonstrating the transition of the change as follows. Self-directed, talented people benefit considerably from such a market: the more talented they are, the greater the demand for their services and the better their opportunities will be. Highly talented people are less likely to be blocked by less talented bosses taking credit for their work. Better opportunities also ensure that job experiences challenge these employees, who in the process develop more quickly. At the same time, senior people who are pursuing important opportunities will have a greater pool of talent to draw upon, with a more diverse range of skills to tap. People who acquire reputations for developing talent will have a greater likelihood of attracting more and better job applicants, while "people eaters" will have trouble. But the real beneficiary is the organization, which wins by getting far better matches between its job opportunities and its most talented people and by gaining far greater transparency into shortages and excess supplies of talent. Projecting the approach to the EO grade, we should ask those waiting for a posting what is their state of mind. Some desire certain jobs, but they are either too afraid to ask, or asked but to no avail. We should also ask those supervisors waiting for a post in the office to be filled. They may wish to have a good subordinate, but are at the mercy of the grade management. A talent marketplace may be the solution.